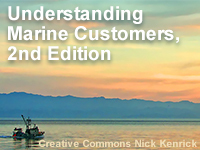 Understanding Marine Customers, 2nd edition, introduces the different marine forecast customers and discusses what forecast information they need to know and why they need to know it. A better understanding of the needs of the marine forecast customer will lead to better daily forecasts. The 2nd edition expands upon marine customer base to include more nearshore users, such as beachgoers, surfers, and sea kayakers. Learned a lot about boats, waves, and customer needs. this should be mandatory training for all new maritime forecasters. understanding how different wave characteristics impact and create hazards is essential. If you are really a sailor, just take the quiz and THINK your way through it. Save doing the actual coursework for a rainey night just prior to the summer boating season (Memorial Day to Labor Day); wishing you 'Fair Winds and Following Seas". A very useful and informative course for people interested in Oceanography. Excellent introduction to terminology and relevance to end customers. Diagrams, animations, and interviews aided understanding. It is very interesting to understand about our marine customers because we can learn from their concerns and we can improve our service with better and high quality of weather information. They are also our main income who pay our service. I didn't know I tested out... am still taking the course. Quiz was common sense for the experienced marine forecaster. Thank you. This is on the job training for me. Nice introduction to the course.